MarsAtlas is a model of cortical parcellation. It can be applied to any cortical surface via the HipHop parameterization pipeline, available in the BrainVisa Cortical Surface Toolbox, under the Anatomy category. MarsAtlas has been developed in collaboration with Andrea Brovelli and Guillaume Auzias at INT. You can get details on the MarsAtlas page. 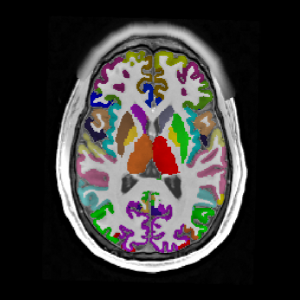 Subcortical structures are imported from the Freesurfer segmentation. We present below a short tutorial on how to produce the MarsAtlas + subcortical structures segmentation on any data. In order to visualize properly the atlas, with the same colours than the picture above, and no neighboring regions with the same color, you need to use the color map ‘MarsAtlas-subCortical’. Once anatomist is restarted, the colormap should appear at the bottom of the colormaps list. In order to get the entire cortical + subcortical parcellation, segmentations need to be performed with FreeSurfer. This can be done using the FreeSurfer toolbox. Segmentations can then be imported to BrainVisa for surface reconstruction, sulcal labelling, and cortical parcellation. Below is a short tutorial showing each step. Most of this tutorial has been written with Andrea Brovelli. For specific details of each process, refer to the BrainVisa documentation. FreeSurfer must be installed on your system. In the BrainVisa preferences, the FREESURFER -> freesurfer_home_path field must be filled. Create your BrainVisa database (BV -> preferences -> Databases). Create a FreeSurfer database (BV -> preferences -> Databases). Run Freesurfer -> Freesurfer / BrainVisa full pipeline on your subject’s T1 image. Run Freesurfer -> Import -> Import FreeSurfer Grey/white segmentation to Morphologist on your subject. 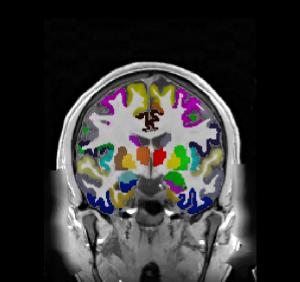 The subject is now in the BV database and can be processed in the Cortical Surface Toolbox. Run Cortical Surface -> Anatomy -> Hip-Hop Cortical Parameterization on your subject. This will produce the MarsAtlas surface parcellation for each hemisphere. Build the volume MarsAtlas cortical parcellation using Cortical Surface -> low-level -> 2D parcellation to 3D parcellation process.